Part Number CXB000200HFN. 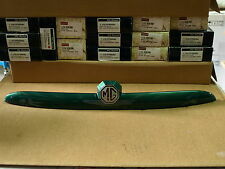 Genuine MG Rover MG ZR. Handle Assembly Tailgate Le Mans Green. Prices remain in force until we publish new prices on our website. Best of Rover Spares LTD. With a plethora of parts available on the shelf, we should have the part you require. It represents the standard we aspire to achieve on goods marked as such. 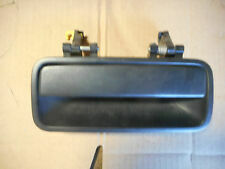 Rover 25 external door handle o/s rear from 51 reg. Part Number: CXB500120. 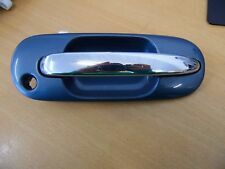 Part: Left Side Front Outer Door Handle (JRJ Tahiti Blue). Model: MG F // MG TF. Condition: Good condition, Item is used so expect the odd wear mark as photographed. 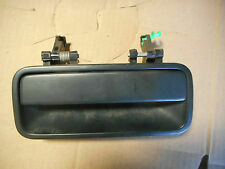 Rover 25 external door handle n/s rear from 51 reg. Part Number: CXB500120. Part: Left Side Front Outer Door Handle (LVD Charcoal Grey). Model: MG F // MG TF. Condition: Good condition, Item is used so expect the odd wear mark as photographed. COLOUR CODE: JBR. WE HAVE THOUSANDS OF PARTS ON THE SHELF READY FOR DISPATCH. OFF SIDE FRONT. Part Number: CXB500100. 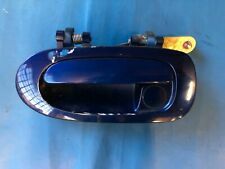 Part: Right Side Front Outer Door Handle (JRJ Tahiti Blue). Model: MG F // MG TF. It represents the standard we aspire to achieve on goods marked as such. Prices remain in force until we publish new prices on our website. West Midlands. All orders are subject to availability. With a plethora of parts available on the shelf, we should have the part you require. COLOUR CODE: HFY. COLOUR: ARBOUR GREEN. WE HAVE THOUSANDS OF PARTS ON THE SHELF READY FOR DISPATCH. OFF SIDE FRONT. Part: Left Side Rear Outer Door Handle (Nightfire Red 2 CAQ). Model: Rover 25 MG ZR. Condition: Good condition, Fully Tested, item is used so expect the odd wear mark. PART NO:CXB102930WLL. N/S/F OUTER DOOR HANDLE TO FIT ROVER 45 [LHD VEHICLES ONLY]. Plastic round fixings may have cracks but fixings tight. Door catch - NSF Left,Front. 1998, Rover 214, 5 - Door. In good condition , supplied with 3 months warranty. MG Rover Parts Number CXB10072PMD. Rover 45 left front door handle in night fire red. there is a bit of laquer peel as picture. HERE WE HAVE A ROVER P4 SPARE WHEEL DOOR HANDLE. IT IS AN ORIGINAL PART IN VERY GOOD ORDER WITH ORIGINAL SHAPED MOUNT WASHER. WOULD BENEFIT A COAT OF PAINT. LH Front (UK passenger) outer door handle in flat red, for 2 door Rover 200 mk2 models including coupe and cabriolet (not 'bubble' shape 200). Prices remain in force until we publish new prices on our website. Rover 45 right rear door handle in night fire red cbt. Fixings intact plastic may have cracking around fixing points but still tight. Fits:-Rover 25 5dr Hatchback models made from:-2000 to 2006 with Part Number:- CXB101520/530XXX. 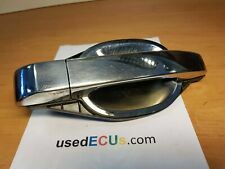 For Sale:-Rover 25 Exterior Door Handle Driver Side Rear. Wing Mirror. We always try our best to help. We're here to help whenever you need us. Here we have for sale: Range Rover Sport L320 05-13 RHD Front Left NSF Exterior Door Handle with Carrier AH22-203A29-FB. Model: Range Rover. Part Number: AH22-203A29-FB. Engine: 2.7 TDV6. Make: LAND ROVER. Model: Range Rover Sport L320. Body panels and other vehicle body parts are used and will have normal tear and wear. We do not decode them prior to sale. All Parts are used and may have hidden faults. Engine: 3.0 TD6. Model: Range Rover L322. Make: LAND ROVER. Body panels and other vehicle body parts are used and will have normal tear and wear. We do not decode them prior to sale. Paint: Giverny Green. Colour Code - MNX - Platinum Silver. Removed from a '51' plate '2001' Rover 45, 1.4 Petrol 5 Speed Manual in good working order. Vehicle Designation - Rover 45 Hatchback. The donor vehicle was scrapped due to early signs of head gasket failure. Nearside Front Exterior Door Handle. Electric Front/Manual Rear Windows, Manual Wing Mirrors. Exterior Colour Code. 5 Door Hatchback. The table below contains further information. Interior Trim Code. Part Number: CXB102920. Part: Right Side Front Outer Door Handle (JFV Trophy Blue). Model: MG ZS.